I love adding new ornaments to my tree each year. Sometimes I buy them, but I really love making them too. This year, I thought it would be fun to create a little “family” of ornaments — one for me, one for my husband, and one for each child. I was inspiration by wooden ornaments that I saw at Crate & Barrel last year and knew I just had to make them. They turned out so cute … now I want to make a little set of ornaments for every family I know! 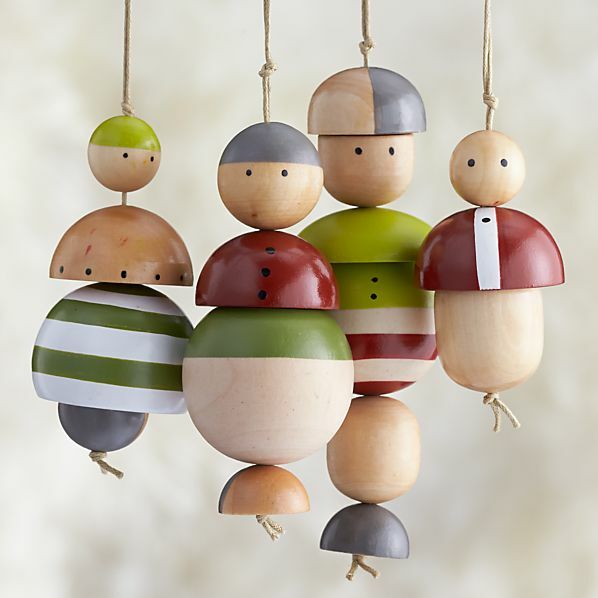 Wooden peg dolls come in many variations, which makes them perfect for this project. With a little paint (and patience), you can whip up a holiday family in no time. Step 1: Add paint to your peg dolls in your desired colors to represent basic clothing and hair. I kept it very simple with color blocks and stripes. (Note: I didn’t tape anything off, these were free-handed. The lines don’t need to be exact.) Step 2: Once you are satisfied with your clothing designs, use the end of a paint brush in black to add dots for eyes and additional details. If you wish to add a protective clear coat, do it now. Allow everything to thoroughly dry. Step 3: To hang the ornaments, an eye screw will need to be inserted into the head of the dolls. The thread of the tiny screws enable them to be inserted manually. I find it easier to drill a starter hole and then twist it into place with my hand. (Worried about setting the screw in the wrong place? If you look closely, there is a small ring, formed by the wood grain, at the top of the head. Place the screw in the center of that and you’re golden!) Step 4: Add a loop of ribbon or twine and hang!